There’s one little problem, and that’s that getting these new letters into the text files isn’t going to be very straightforward at all. It’ll probably be a real pain. I’ll see if I can help fix that a little bit, but translators might have to use a clunky workaround like typing  instead of ñ. It’s hard to explain but it’s mostly due to the fact that there are so many different text formats out there and different text editors mess stuff up in different ways. I don’t remember what this looks like in EarthBound Zero, but hacking this to include lowercase letters + all the international letters would be a really huge undertaking, so right now I’m planning to leave it like this. I agree! 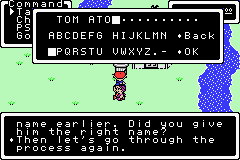 Maybe you can put an option to change the letters to lowercase (like in EarthBound) for the player naming screen? If it is too hard to put lowercase letters into the player naming screen, you could maybe stick with the option of an 1.1-patch a year after 1.0 or something like this. We could play the game and you would have much time to fix such “unimportant” things. Well, if it’s too much trouble, then don’t mess with the player naming screen. By the way, I noticed that the battle text box could be expanded a little more (making room for two more columns), and that the far-left column never has text in it. Any reason for this, Mato? You should leave the international naming screen for the english version because it’s doesn’t look very good having all that blank space. Secondly you never know if someone wants to give someone an exotic name. Awesome work, Mato! We really appreciate all the work you’re putting into this project! As a possible Braz. Portuguese translator, thank you for including ‘ã’ and ‘õ’, those are often left out (since they’re only used in Portuguese, Vietnamese and a few others). Aaand due to the pixelated font, ‘õ’ may also be used as ‘ő’ for Hungarian. As a Mexie, I can say I like the way the accent on the vowels look, along with the ñ and Ñ. And yeah, electric baths are tasty! It would be cool to play the game in spanish, English is my first language but I always have fun playing through an RPG in spanish since I’ve studied the language all throughout middle and high school. Hey Mato, I was going over the to-do list, and one thing had me confused. “Make it so some lines use the original size textbox” I don’t get it. Why would you need to shrink the text text back for some lines? @TGM: I would think he’d do that to try to fix some issues with the expanded text box. When you use an item or a PSI on someone, it puts the cursor down in the bottom left area, but the expanded text box gets in the way. When a character’s HP or other stat changes, the game updates their names and their stats too, which gets printed right on top of where the expanded window is. There are many other issues too, some of the videos I’ve posted show this happening, in fact. It’s going to be a really unfun problem to deal with, and in the worst case scenario I may have to undo the expanded text box entirely. Zunar: Technical reasons if I remember right. I’ll give it a look later, I think it’s because it technically acts like regular text,which always has two spaces except if there’s a little dot at the start of a sentence. I apologize for arguing about the names in the previous update Mato, but I just had one more thing I wanted to say. @Zunar: You said he may look like a farmer but looks can be decieving, well then your suggestion of hillbilly is just as wrong becaue you don’t know he lives in that rural area. He could just be a man from the city who is hiking in that area. Again, sorry Mato just oner last thing I wanted to say . One suggestion I have to say is to change the keyboard-style of “12345 67890” to the numeric sorting system of “01234 56789”. Other than that, the naming screen looks GREAT! Thumbs up, Tomato, god among men. I am so freaking happy to see new and continued progress on this thing! Can we throw money at someone? 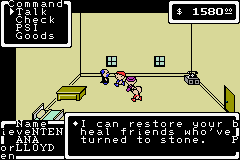 The player’s name doesn’t appear in any text in Mother 1, does it? If not, and if the credits are displayed in all caps, leaving the player’s name entry in all caps doesn’t seem like it’d be a big deal, unless people would want special characters there for whatever reason. That would create a whole new pile with the credits font and all, though, wouldn’t it? Or does the player’s name even appear in Mother 1’s credits? I’m going to feel awfully silly if it doesn’t now. Also, I’m going to be a jerk and nitpick your joke text: Those “baños” should be “sabrosos.” It’s a masculine noun. I’m pretty sure (not 100%) that the player’s name is printed in the end credits using the regular font, so if it were possible to input other text then it’d still display fine at the end. But I haven’t really checked that code much. Just curious, did you fix the bouncing glitch yet? Oh yeah, that wasn’t something so much to be fixed as it was to just be taken out since I was altering the wrong data. And those letters are looking great, don’t really know how you could improve them. PD: I moved that musical note too, only to bring balance, harmony, peace, or clarity to my mind. Not a big deal, anyway. 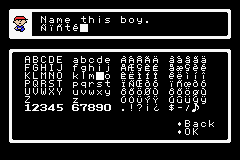 ^There’s not really any need for that though, since their default names (save for Ninten) are already typed in once you reach their naming screen. Yeah, you do have a point, Anon. But for the Food, there is no “Don’t Care” thing for it, and it has no typed in name. It’s just a suggestion, to make it a little more like EarthBound and Mother 3. I don’t really want to make stuff up out of nowhere, so I don’t plan to add default names that aren’t already in the original GBA version. Maybe I just missed it, but it seems to be missing ß..? 1. Now that the goal of translating the Mother 1 side of the game is getting ever closer, do you think it’s even mentally possible for you to translate the Mother 2 side? 3. 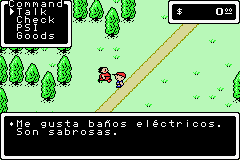 In terms of Mother 2, do you think it would be easier to translate on the GBA version or the SNES/SFC version? 4. You’re definitely taking a break after the Mother 1 translation (unless you’re a genetically modified tomato) have you decided whether you’re going to translate the Mother 2 side, leave it untouched, or tackle the SNES/SFC version? For #2, I would imagine you can expand GBA ROMs just like you can expand SNES ROMs. But Mato has said many times before, the Mother 1+2 ROM already has tons of free space available, so expansion should not be necessary. Mato said he’d go insane if he translated Mother 2 GBA right after. Jeffman was gonna take care of it, if I’m remembering right. 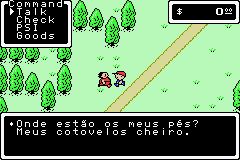 I don’t think Mother 2 needs to be retranslated, though–just touched up to remove some of the bowlderizations. anders: Would the beta symbol suffice for ß? Due to text format stuff I can’t see what the other two letters you typed are, though. 3. Well, it’d be easier to hack on the GBA at least. I’m much better at GBA hacking and the GBA has a faster CPU speed and better hardware. 4. I plan to take a break, I have other important projects and stuff to take care of after this. 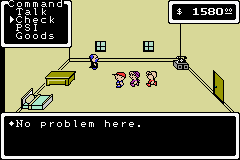 I’d like to work on the Mother 2 side (I might include a menu patch-style translation for it in the M1 translation patch) but there’s just so much work to be done for so little gain right now. If I did work on it, it’d be the GBA version, not the SFC version. I do have one small request, Mato. Could you do a little of what RPGOne did and add Ninten’s name in automatically, like Ana, Lloyd, and Teddy’s names are? Are for the food, can you put it in as Prime, P. Rib, or something like that? Prime Rib is Ninten’s favorite food (I searched the ‘Net for that info a while back). -Ò/Ó and ò/ó were exactly the same before. The only way to distinguish them is give to Ò/Ó a extra pixel, but i don’t know if that is possible. It is, Tomato? -Moved things: Yeah, no big deal. -The rhombus. I prefer do not include EB ones. And the same on MOTHER 2! Where exactly did this Prime Rib information come from exactly? Probably a strategy guide or the like. I don’t take it as 100% official, so I’m not going to add it into the game. Are you able to put a “Don’t Care” option into the game, or would it be too difficult? Then you could make it say “Prime Ribs”, “Steak”, and “HUMANS”! The info about Ninten’s favorite food being prime rib is from the Nintendo Official Guidebook (Encyclopedia Mother). So, it’s at least not just some random guidebook. Adding a don’t care option would definitely be a ton of work, and again I don’t really want to add stuff in out of nowhere (easy ring aside). Well, could you please just add Ninten’s name in and something along the lines of Prime or P. Rib for the favorite food, please? Please, Mato? RPGOne put Ninten’s name there in their translation. It’s not that hard, is it? Please? He’s said “no” three times now. Just let it go. That’s issue I’m addressing, Anouki! He doesn’t really have a name, he’s technically called “Boku” (Me) because you’re the one who’s supposed to name him. Ninten is just one that got popular because it was used in guides and stuff and even got used in Brawl. Ken is another name he’s known by (including the novel), and I think there was a third name too. It’s clear that his name specifically is supposed to be up to the player, which is why he has no default name. This tells me that “Ninten” is probably just a placeholder name that Nintendo used to give player-named characters in screenshots like that, and that someone saw it somewhere in relation to the Mother character, causing them to erroneously assume it was his real name. The fact that Mother 2’s “Ness” is an anagram for SNES and a homophone for NES probably didn’t help. This being the case, I was surprised when the name “Ninten” turned up in Brawl. I always wondered if that was the case in the Japanese version, or if Japanese Brawl just calls him “boy” or “protagonist” or something. Damn the lack of a language option. Boy you people are persistent. How many times does Mato have to say “no” before you get the hint. So Mato, you’ve released patches for Mother 1+2 in the past, like the Easy Patch & an earlier translation patch. Plus, wasn’t there something about an easy-mode key? Anyways, so will this translation just be more up-to-date than your last one? And then you’ll put the patch up for download when it’s complete? No rush, I’m just curious. Zunar I like your enthusiasm but calm down a bit. He’s said he’s not going to do it and explained why. Since we’re free to input whatever we want, it’s basically covered, so don’t worry about it. The whole “Ninten” thing is getting interesting. Brawl says his name is Ninten, but now I’m wondering myself if that was in the original Japanese. Fire Emblem: I haven’t released an early patch of the translation, are you sure you’re remembering right? But I know you’re working on an Easy Ring, as well as this current translation. So, will this translation just be a better, more complete translation? Will it include the uncensoring you mentioned? And will it include the Easy Ring, or will that need to be downloaded separately? You can almost put Mother 1+2 and 3 on 1 cartridge! The ROMs of Mother 1+2 and 3 add up to 32173 MB. Wow this is really shaping up! Good job Mato! Hooray for automatic single and double quotation mark changing! FireEmblem: the patch will include the Easy Ring stuff. I haven’t decided 100% about what I’ll do with the uncensoring, but I’ll release a way to uncensor stuff one way or the other, even if it’s an alternate patch. The text translation should (hopefully) be better and be more enjoyable, especially for EB fans. Mato, have you decided whether or not to include the graphical updates to the enemies? Do you mean uncensoring or do you mean better graphics? I don’t have time/energy to do the better graphics stuff, so it won’t be in this patch at least. I meant the better graphics, like you mentioned in your 2nd translation update. But ok. If I could do it, I probably would, but I have no idea how to do that. I was playing, but then I had to start over because in late 2010 my dad got a new computer to replace our old one. Now I’m trying to progress in the game on my netbook. I forgot to mention that I was level grinding Ninten to lvl 35 so he could learn SuprHealing. I was somewhere around Lvl 28-31. SO CLOSE. Good luck on the upcoming hard schtuff! You’re doing an incredible work with this rom, Mato! I don’t mind if you finish the patch tomorrow or in 2015, but don’t give up, please! I hope it doesn’t take until 2015, especially since the world will end in 2012. Using beta for ß is fine, I imagine (German isn’t my native language, so I suppose I can’t say on behalf of Actual Speakers ™, but betas are used often enough in books and things that people are probably used to it :P). 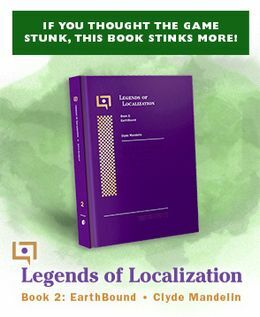 It’s one of my pet hates, but that only applies to printed things where the publisher should know better; GBA games aren’t really known for their beautiful typography in the first place. WordPress seems to have killed those links. They were only to Wikipedia though. Hey, this is great! We don’t mind having to type s. I mean, we can type the text normally and replace everything later with Ctrl+F. Mato, onde estão os meus pés? JFDP13: I used your suggestions, thanks! Mini-update: I haven’t had much time for this in the past few days (heavy real life workload) but I managed to knock another thing or two off the to-do list. Only the hard stuff is left now mostly, blegh. “Onde estão meus pés? Meus cotovelos estão cheiro.” > I know it was just a sample, but I laughed SO HARD at that! Can’t wait for this to be finished! Mato, just to let you know, if you do make it so you can translate the game into other languages, you probably need to easily make any command windows bigger, since what you could put in English might take more characters to put in in another language. Also, I have a question. Is it possible to easily extend the character limit on the favorite food to 9 or 10 characters? Just curious because Ken’s favorite food is Prime Rib and you can’t fit that in 6 characters without abbreviating (e.g. P. Rib or just Prime). Window resizing shouldn’t be much of a problem but it won’t exactly be “easy” either. I’ve had it in mind throughout the entire project though. I don’t know if it’s possible to expand the fav. thing. To be honest, I’d rather not mess with it, messing with strings that stay mostly in RAM are trickier because you never know for sure what’s going to happen to them throughout the course of a playthrough. I understand. I was just wondering. If sometime in the future if you had some extra time, could you please try it out and see if anything messes up? If it’s too much trouble, then don’t worry about it. I had just remembered about how you extended the character limit in Mother 3, and that reminded me of it. Mini-update: I’ve got the basic code in place for letting the game switch between the full-size text box and the original-size text box, now I need to go and manually identify all the lines in the game that will need the original size box. Then I’ll have to go in and edit those lines to have proper formatting for the new box size. But if all goes well it should knock most of the rest of the programming left to do. Mato also how much lang. do u know?!?!?! off topic and kinda pointless, but I was wondering if the animated background from that old ebzero hack could make its way in? It may not have been much; but just the slight starry background made it feel that much more earthboundy….and I sortal liked it and miss it since that old hack isn’t compatible with new hacks and sorta messes up stuff when used. I wish but wouldn’t that need like a major battle engine overhaul? Correct me if I am wrong as I would love to see that as a new addition. Just thought of something, this isn’t really related to the Mother 1 section of the hack, but is the Mother 2 title screen changing into Earthbound’s one? @PSI Rockin’: I seriously doubt it. Mato said he wasn’t going to change the names of the games, so why would he change the title screen to a different game’s? translate this stuff. Can you teach me?